About 15 years ago, a friend of mine, Tom Rami, invited me to take part in the March Madness pool run for his family and a few close friends. With a stroke of beginner’s luck, I won that year. Since then, I’ve been in the pool every year, and my wife started playing several years ago. It took me more than a decade to win a second time. This pool never gets old because the format is so much different from most pools. With the Rami pool, participants get to make a new set of picks each round. If you have a bad round, you still have a chance of making a decent showing in the pool. This is so much better than watching your picks go down early and then having no reason to stay interested in the pool. 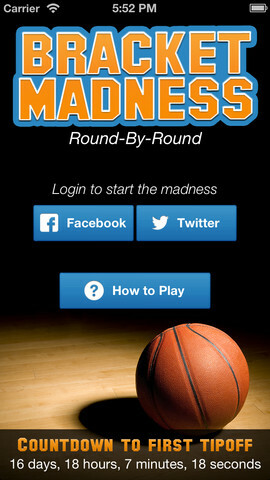 Tom’s son, Michael, has turned the Rami way into Bracket Madness, an app for iPhones, iPads and iPods. (Next year, it will be available for non-Apple products.) So now, you and your friends can download the app and create a private pool for yourselves. If you prefer, you can be in a public pool. With this app and style of play, you’ll have no more one-and-done disappointments and no more busted brackets on the first day. With Bracket Madness, you pick a winner in each game round-by-round. You get 63 chances to show your hoops IQ. Upset points are awarded when a lower seed beats a higher seed, so standings in the pool change quickly, and slow starts aren’t a nail in your bracket’s coffin. To you, every game becomes a nail biter. Points accumulate. Tension mounts. The app is built so you can trash talk your fellow roundball junkies with Tweets and texts. Taunting is encouraged. I guarantee this is a much more exciting pool than others you’ve taken part in. You have to stay on top of making your picks, which can be especially challenging on the first Saturday of the tournament. (There’s no sleeping in that day!) Round by round, you keep interested because you constantly have to size up the remaining teams and how they’ll fare against their opponents. The app is available for 99 cents. It’s a much more exciting and interactive way to play. I’ve downloaded Bracket Madness. You should too. You’ll have the most exciting March Madness pool ever. This entry was posted in Communications, Society and tagged college basketball, NCAA tournament. Bookmark the permalink.